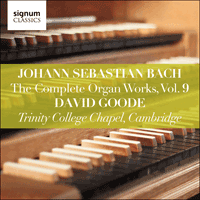 David Goode once more takes to the console of the Metzler organ of Trinity College, Cambridge, for a ninth volume in this grand undertaking. The Prelude of BWV531 announces its rhetorical argument with a bold pedal solo. The material transfers onto the manuals with broken chord figurations underpinned by scalic figures in the pedal. This Prelude, often noted for a similarity to Böhm’s C major Praeludium and in many ways typical of its North German heritage, is striking for a certain simplicity. Missing is the more daring qualities of chromatic harmony found in later Bach preludes, a fact that reflects the work’s early provenance. This simple clarity—especially evident in the harmonic scheme—gives the movement an elegance, letting the passage work of the manuals develop toward a thrilling close. The Fugue opens with a subject that maintains the arpeggiation of the Prelude’s figures, though given a more melodic turn. The Fugue is marked by extensive episodes of manual-only writing, the brevity of the subject reflected in the smaller role played by the pedals throughout. A long dominant pedal (G) brings an interruption, after which a written-out trill leads to the final cadence. BWV730 is a harmonized version of the chorale tune, in five parts. Its texture and working are stylistically reminiscent of the Orgelbüchlein chorales. Embellishment is kept to a minimum; there is none at all for the first half of the chorale, but some included in the second half. The skill of the setting lies in its harmony and rhythm, the phrases dovetailed neatly with overlapping suspensions prepared by an off-beat pedal rhythm, producing an affect of yearning. The second half also features an elegant walking bass, giving momentum. To some this has also suggested the lines of the text ‘von der Erden ganz zu dir’ (‘from the earth wholly towards you’). BWV571 is a multi-sectional work, like a Buxtehude Praeludium, though its authorship is contested. The first part is a lively fugue, leading to a shock-cadence, a musical question-mark, on an inverted B major chord. There follows a transition of freer material that moves the music to the minor. The second part is an Adagio, with beautiful imitative counterpoint in E minor, given especially affecting harmony toward the end. The third part is an Allegro, with pedal, with striking repeating descending scale figures in long pedal notes, against fast rising scales in the manuals. There is a neat harmonic trick at the end, as the music apparently veers toward C major (the subdominant), over a long G (tonic) pedal; but at the last moment the final cadence introduces the crucial F sharp, bring back the home key of G major for the final cadence. The chorale partita Sei gegrüßet, Jesu gütig opens with a straightforward setting of the Chorale in four parts, with exquisite part-writing and an elegance created by the almost constantly running quaver pulse. The cadences are brought out of the texture with semiquaver figurations, and the overall affect is one of gravitas. Partita I is written as a bicinium: the left hand has a melodic and harmonically suggestive bass line, really a cello line; the right hand has a richly ornamented version of the chorale melody. Again a metrical feature that intensifies the musical conversation is the constant division of the main beat, in this case with runs of demisemiquavers in the right hand. Variations I–VI form a natural unit, exploring textures on manuals only. Within this, two-, three-, and four-part textures are explored. Partita II is a variation on the original four-part harmonization of the chorale, with the melody at the top of the texture, but with decoration and elaboration in the form of semiquaver figurations and passing notes. Partitas II–VI are also united by the presence of a single motif that dominates each particular variation. Partita III is an energetic two-part texture, with the notes of the chorale incorporated into a constantly running semiquaver line. The left hand supports with a walking bass of quavers, at half the speed. In Partita IV the chorale is decorated with alternately ascending and descending scales, combined with a short three-note motive, heard throughout. The most striking feature of Partita V is the left hand, which plays a repeating rhythmic pattern of demisemiquavers and semiquavers, animating a two-part right hand, with the chorale on top and a quaver inner part. Again, Bach maintains the four-part choral texture inherent in the original chorale, but transforms it in line with the keyboard idiom. Partita VI is a rhythmic variation, with the original 4/4 time now transformed to 12/8, with a triplet feel to the division of the main pulse. Again, the four-part texture is maintained, and a single motive dominates. In Partita VII the texture moves from four-part manuals to a trio texture, the chorale now in slow notes in the pedals, accompanied by two voices that play off one another. Listen for the final bars, where the two manuals join together. Partita VIII features running semiquavers throughout in a compound time, the chorale melody reaching its most florid elaboration. The bass-line preserves the original harmony. Partita IX is another trio, with the pedal taking the chorale, and the left hand acting as a bass-line. Again, the manuals are in tandem, musically engaging with each other, and joining forces at the close over the final pedal G. This is the first variation in triple time (3/4). Emotionally, Partita X is the heart of the whole work, standing out from the other variations in its length and scope. Generically, it mixes together a solo chorale prelude and a ritornello form. The phrases of the chorale are always played twice, firstly with an ornamented version of the chorale, and secondly as a plain cantus firmus. This is developed with the addition of a second cantus chorale voice that joins for the final two phrases of the chorale. The emotional centre of the movement comes in the final phrase, on the final few notes of the chorale, as the cantus opens out into a glorious sequence, with the pedal in running quavers. Partita XI is a return to the original harmonization that opened the work, though now in five-voices. The affect of gravitas is doubled, literally: where the opening chorale added constant quavers to the background of the chorale, this has semiquavers. The Fantasia BWV537 in C minor is given highly wrought counterpoint in five-parts that spins itself from a simple opening above a long-held pedal. The melancholy affect is suggested throughout by suspensions, anguished leaps of the minor sixth, and musical sigh figures. Its emotional potency was noticed by Edward Elgar, who orchestrated both Fantasia and Fugue in 1921-22. The Fantasia is in two sections, each culminating in a climax, and ends with a ‘half-close’ cadence, itself unique in Bach’s Preludes. A simple transition leads to the Fugue, in fact a double fugue (with two contrasting subjects) in four parts. The first subject is strident, rhythmically varied, keeping within the notes of the key; the second is smoother, chromatic, and given in even notes. This leads to a sort of ABA structure: the two subjects don’t come together, so when the first subject returns at the ends there is a real sense of ‘arrival’. The final cadence plays out over a long held pedal G bringing the fugue to an exciting close. Williams points out that the manuscripts for BWV537 were copied by J T and J L Krebs, and anecdotal evidence that the MS was almost used as waste paper! (Williams, 2003, p.60). BWV702 is written as a four-part fughetta, with the chorale melody incorporated into the counterpoint. The subject of the fughetta is drawn from the first two lines of the chorale melody. The Prelude moves from quavers to semiquavers, and harmonically from pure diatonicism to more chromatic writing later. The end is striking, with an unusually high cadence in the upper register of the right hand; this has sometimes cast doubt on its authenticity (see Williams 2003 p.441). This is a four-part setting of the chorale melody associated with Luther’s setting of the Nicene creed. The affect is stern, the Prelude written in the stile antico, in a slow duple time, which allows the chorale to unfold slowly. This gives a sense of the stability that is suggestive of the text. The setting exegetes only four lines of the chorale, perhaps owing to the repetition in the melody and unlike BWV702 the counterpoint is varied enough to suggest authenticity. This Trio in two movements is an arrangement of a sonata in C minor for two violins and continuo that is attributed to J F Fasch (1688-1758), who was a competitor along with Bach for the Leipzig cantorate in 1722. The first movement has a melancholy affect, though with an elegance arsing from its neo-galant style. The prominent dotted motif is passed between the hands in the manner of a question-and-answer, and the Adagio contains Bachian sequences. The second movement features a long ritornello—like a concerto—and is motivically rich with attractive sequences. The Prelude in A minor, BWV543, begins with a free, chromatic fantasia in the manuals in the manner of a classic North German fantasia with broken chords and runs over pedals points. There are pedal solos and sequences driven by repetitive motifs. The Prelude is distinguished by its marked affect—anguish. The Fugue opens with a long, diatonic subject which is highly melodic and sequential, giving ingredients for one of Bach’s most mellifluous fugues, full of sequences and counterpoint that is beautifully inverted. The Fugue shares with the Prelude a tendency for the musical arguments to unfold slowly, with the harmonic rhythm kept slow—the balance between the high level of surface detail and the slow nature of the underlying harmony is one of the chief sources of the Fugue’s dignified feel.